April 16, 2011 marked the untimely passing of Howard “Bud” Moreau, an iconic figure from the early days of the sport of power lifting. After a long day of work for Provincial Crane, Bud would find his way to the gym, a place that was his second home; Bud knew the concept of basic hard training. For Bud, training was more than a fad, it was his love and passion, as he was driven and determined to be the best he could be. No fancy gear, no high tech clothing, or energy drinks, just the basic equipment – individual weights, and a metal bar, plus a multi hour training ritual sprinkled with jokes and laughter. A group of training partners regularly assembled with Bud, the leader of the pack. Bud knew the importance of commitment and reliability. He was always there to encourage his training partners on their own lifting journey. Bud inspired others to follow, through the example and standards he set for himself. Bud was very successful in competitions, winning numerous local, regional, and provincial events, including no fewer than seven Canadian Championships. 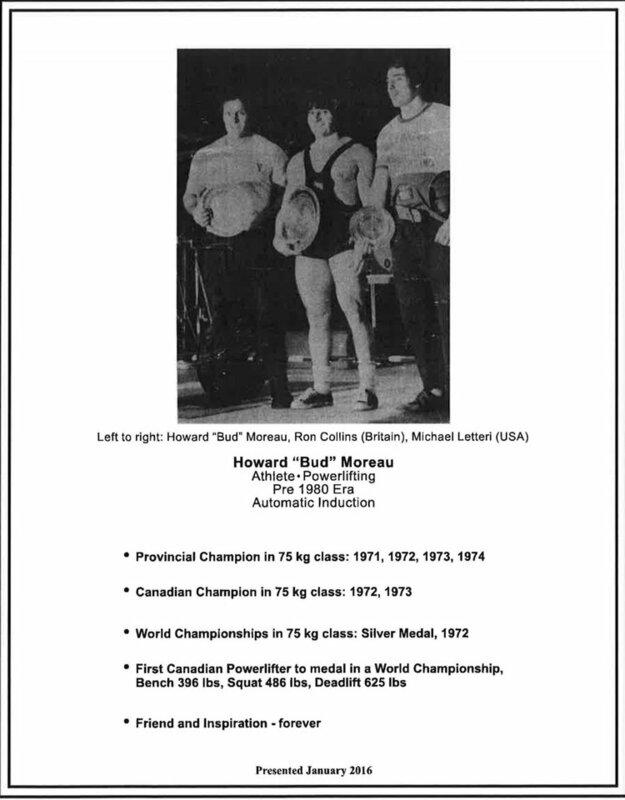 In 1972, Bud entered the first ever World Powerlifting Championship, held in York Pennsylvania, and made Canada proud as he came home with the silver medal, placing 2nd behind his British competitor Ron Collins. Young athletes from all sporting disciplines could take a lesson from Howard “Bud” Moreau. Nothing beats commitment, reliability, dedication, and hard focused training. Bud was the epitome of dedication and discipline and, it paid off, in the gym, at work and throughout his life.